After a day of doing nothing in Sa Huynh, Walter and I packed up. The easy-going Belgian was planning to take a train somewhere to the south, and I had an easy 65 k ride to my next objective, Quang Ngai. 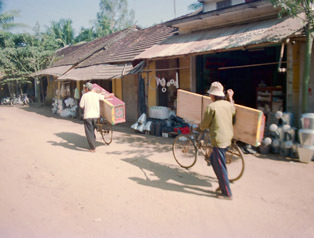 Although Quang Ngai's a sizable town, there's not really much to do there. Its claim to fame is its vicinity to My Lai, site of the infamous massacre in 1968, when American soldiers gunned down hundreds of civilians. Leaving my panniers at the Song Tra Hotel, I biked out of town, to the memorial. 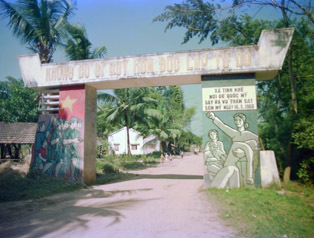 The My Lai memorial is down a dirt road, 10 k off the main road. Bouncing along this rutted path, I sensed that not many came to visit the memorial. Once there, I locked up the bike, and entered the grounds. While there wasn't much to see, I had the personal attention of an English-speaking guide. So far in Vietnam I hadn't experienced any anti-American hostility, and, if there was a place where it would surface, this should be it. I didn't have any problems -- the guide was friendly, and the few other Vietnamese on the grounds weren't that interested in me. The guide shared two bits of information that added perspective to the atrocity that took place here. First, the massacre took place just two and a half months after the Tet offensive. This area had apparently always been strongly pro-Viet Cong, and thus the hamlet was a natural target for retribution. Second, she stated that the area was bombed and shelled heavily for months after the massacre. I had to agree with her suggestion that this indicated an official interest in covering up the work of Charlie Company. With the sun beginning to drop, I bicycled back to the hotel to spend the night. I was on the road fairly early, wanting to move on. Back in Nha Trang, everyone had recommended that I visit Hoi An, 27 k south of Da Nang. My map indicated that it was 105 k to the turnoff, and indeed it probably was, but I didn't spot the turnoff. When a road marker indicated that Da Nang was 16 k away, I knew that I had screwed up. I U-turned, and headed south. I was in a foul mood, because I had just made a 105-k day into a 127-k day. I couldn't figure out how I had missed the turnoff, and I must have stopped every few minutes to make sure that I wouldn't have to U-turn again. Part of my nervousness was due to the language barrier. I'd point the direction I was going, to the south, and ask, "Hoi An?" They'd agree. I'd bicycle on, yet wonder, "Were they just being agreeable?" I found the turnoff -- it was pretty small -- and headed down a bumpy road. Ten k later I was there. I asked for the Hoi An Hotel -- identified by Lonely Planet as the only place that foreigners could stay -- and soon found it. The hotel was really a complex -- a couple of buildings tucked away behind a high wall. The grounds were attractive, and the room rates reflected the relative plushness. The dormitory, fourth-class and third-class rooms were full, but I could have a second-class room, breakfast included, for 265,000 dong. That calculated to about $24, so I signed in, agreeing to stay two nights. On the dirt road to My Lai, I stopped for this photo. 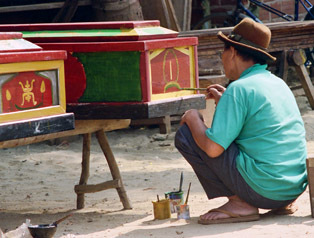 Later I was passed by one of the coffins. 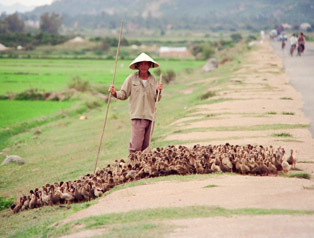 A new roadside obstacle: ducks!